We know waiting rooms can be noisy, bustling and very stressful for your pets so here at the Bramcote Surgery; we pride ourselves on our warm, quiet and welcoming facilities. We have separate entrances and separate waiting rooms for our canine companions and our feline friends and small furries. We use Feliway pheromone diffusers throughout the cat clinic area and DAP diffusers through the canine clinic, again to aid the well being of your pet. 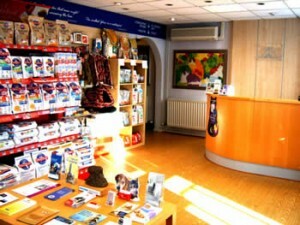 We stock the complete range of Hill’s Science Plan and Prescription diets from kitten or puppy right through to senior. We also understand that not all pets’ tastes are the same so we can also obtain certain other diet food for your pets including Royal Canin, Purina Pro Plan and James Wellbeloved to name just a few. We also understand how important mental stimulation is for our furry friends so we keep a selection of toys and boredom breakers in stock all year round! 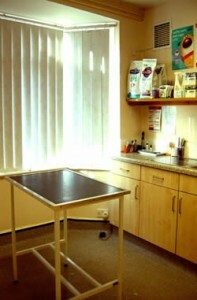 We have a fully equipped, air-conditioned, comfortable consulting room at our Bramcote surgery. 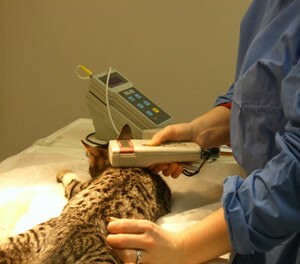 From here, we can assess your pet’s overall health thanks to state of the art medical equipment and years of experience. We can supply all flea and worming treatments along with any medications your pet may be requiring. We also encourage all of our clients to get their pets ‘Identichipped’ as many pets wander too far and wide and become lost. All too often we see stray pets arrive with no collar and no chip. Identichipping is a great way to identify your pet should he or she decide to go for a stroll. 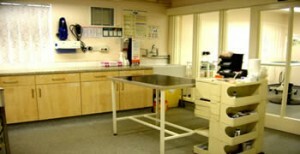 A spacious area where inpatients are prepped for the days operation. Medications can be administered, cannulas placed ready for surgery, and a close eye can be kept on patients. Patients are given some time in the morning after admission to familiarise themselves with their new surrounding environment, and new sights and smells. Our kennels all have under floor heating so your cat or dog will be lovely and toasty warm for the duration of their stay. 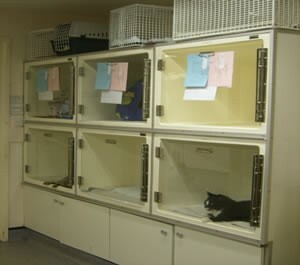 Temperatures are constantly monitored for comfort and we provide cats with comfortable beds and pyramid beds for the more timid pets to hide in. The dental surgery area is exactly as it sounds – where our dental surgeries are performed. Whether it be a simple scale and polish or extractions, we have the equipment to get the job done. Our nurses monitor anaesthesia throughout the procedure ensuring that your pet is safe and sound and helping to put your mind at ease. 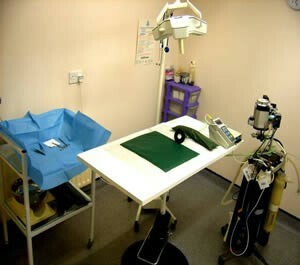 All day surgeries are performed in our fully equipped surgical suite. 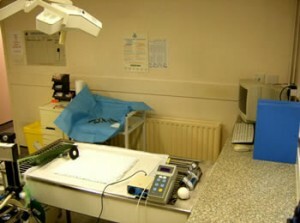 Most commonly on a day to day basis we will perform neutering procedures, mass removals and blood tests. Any patients which require overnight care will be transported to our main branch hospital at Long Eaton where a veterinary nurse is on duty every hour of every day to ensure your pet receives all the attention it requires. 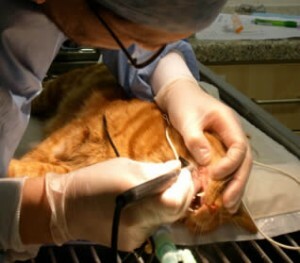 To anaesthetise your pet we use a drug called propofol- one of the safest drugs used in humans. Then through a tube placed in the windpipe, we deliver a gas called sevoflurane. This is much much safer than halothane which was once used in pets just as propofol is much safer than sodium pentothal which is also used in humans. All operations are monitored by our nurses. Blood oxygenation, respiratory rate, pulse and temperature are checked routinely throughout providing your cat with the greatest care and you with peace of mind. Identichipping is the perfect way to ensure your cat can be safely returned to you should he ever stray. Identichips cause no discomfort to your pet. They are implanted under the skin between the shoulder blades and carry an identity number specific to your pet, which is registered on a nationwide database. Your pet can then be scanned with a small portable device which all veterinary clinics will have and your id chip number will show on screen. We can then liase with Identichip, find your details and ensure the safe return of your beloved pet. Identichips do not expire so they offer life long protection. We use identichips with temperature sensors, so no more thermometers are required. You also have the choice of an identichip with no sensor to save costs. Before we chip any pet we ALWAYS check it is not already chipped.